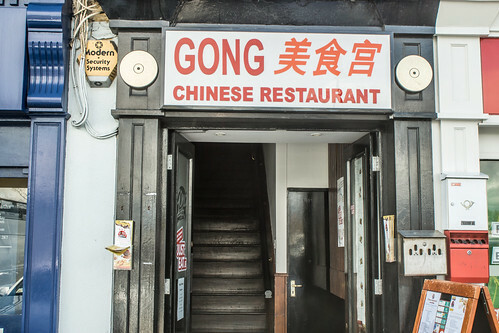 Gong Chinese Restaurant In Stillorgan, originally uploaded by infomatique. Stillorgan , formerly a village in its own right, is now a suburban area of Dublin in Ireland. Stillorgan is located in Dun Laoghaire-Rathdown County, and contains many housing estates, shops and other facilities, with the old village centre still present. Stillorgan neighbours other southside districts such as Kilmacud, Mount Merrion, Sandyford, Leopardstown, Dundrum, Blackrock, Goatstown and Foxrock. My family moved to Woodlands Drive in Stillorgan in 1961 and remained there for about thirty years and during that period there was a lot of change. The Stillorgan Bowl opened in December 1963, the first bowling alley in Ireland. The first shopping centre to be built in Ireland opened in Stillorgan in 1966. It was opened by Dickey Rock. It had 3 supermarkets, Powers, Liptons and Quinnsworth. The first ATM in Ireland was in Stillorgan Shopping Centre. The Shopping Centre now looks rather dated and discussions have been ongoing for many years about expanding and updating it but because of the economic crisis it is unlikely that there will be any major redevelopment for many years.